When someone is suffering from Cardiac Arrest, it is going to be a stressful situation. If you have never been in a situation where using an Automatic External Defibrillator was necessary, or even if you have, the experience can be a very scary. To help prepare to be able to act appropriately in this situation, here are a few of the most commonly asked questions someone might have. How do I know if someone needs an AED? Shake them gently and shout, “Are you okay?” If the victim does not respond then you should apply an AED if one is available. The AED will determine if a shock is required and will not deliver a shock if it is not. Do not worry that you may cause harm by applying an AED to a non-responsive person. When in doubt always apply an AED to a non-responsive person if available. Do I use the same procedure for a child as I do for an adult? Infants and children should never be shaken, so pinch the child on the inside of the upper arm instead. With infants and young children there is a much higher chance that they may be experiencing a chocking event rather than SCA. For this reason it is recommended that you first check for airway obstruction by delivering 2short rescue breaths and watching carefully to see if the chest rises. If the chest rises you should apply an AED as soon as one is available. If the victim is under 8 years of age or less than 55lbs. you will need to change the AEDs pads from adult to pediatric or insert a pediatric key to reduce the energy to be delivered. Can I shock a child’s heart? Children rarely suffer from the type of arrhythmia for which defibrillation is helpful. However, an AED can be equipped with pediatric electrodes that will monitor the child’s heart and deliver the right amount of electrical current for its size if they need to be defibrillated. What if I apply the AED to someone who fainted but did not suffer cardiac arrest? When you apply the AED pads to a person’s chest, the machine automatically checks to determine if his heart is beating normally. It will not allow you to deliver a shock unless the person needs one. If the machine says, “No shock required," just leave the pads in place and stay with the person until help arrives. You may be instructed to deliver CPR rather than deliver a shock. How much clothing do I need to remove in order to use an AED? To use the AED safely you should be able to see the person’s entire chest. If the victim is female, remove her bra. (Cut through it if necessary.) Remove any metal jewelry, too. Metal conducts electricity and may get hot enough to burn the victim’s skin when you deliver a shock. What should I do if the person has a very hairy chest? The defibrillator pads must make good contact with the skin in order to work properly, so remove as much hair as you can. If you don’t have a razor, trim as much as you can with a scissor. If you don't have a scissor, attach the pads over the hair and press them down as firmly as you can. What should I do if the person is wearing a medication patch on his chest? Do not apply the electrodes directly on top of a medication patch. Remove the patch and put it aside so you can show it to rescue personnel when they arrive. Water is an electrical conductor, so if at all possible, avoid using the defibrillator on a wet surface. However, if it is impossible to get to a completely dry location (e.g in a drowning or if you are outside in the rain) don’t waste time moving the victim. Avoid standing directly in water, and dry the patient off quickly before using the AED. Should I do CPR or apply the AED first? If you or someone else saw the person collapse, apply the AED immediately. If you do not know how long the person has been unconscious, do two minutes of CPR and then apply the AED. (Defibrillation is less successful if the heart has been deprived of oxygen for a long time.) Whether or not you deliver a shock, continue CPR as long as the person remains unconscious or until help arrives. If the person’s pulse comes back, should I remove the AED pads? No. Leave the pads in place and continue to monitor the patient until help arrives. Even after successful defibrillation, the victim may revert to an unstable rhythm and require additional shocks. No, leave the pads in place and check the AED again after two minutes of CPR. The person may need additional shocks. Can I deliver more than one shock? If the person remains unconscious after one shock, continue CPR for two minutes and then deliver another shock if the machine prompts you to do so. Check the AED about every two minutes; it will tell you to whether to deliver additional shocks. 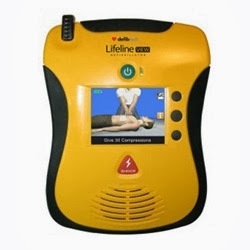 With all new model AEDs, you will be prompted and guided through the event. Can I use the AED on a pregnant woman? Yes. Shocking the mother’s heart is not likely to harm the fetus, but being deprived of oxygenated blood while the mother’s heart is not beating effectively can cause the unborn child irreparable harm. Can I use the defibrillator on someone with a pacemaker or an implantable defibrillator? Yes, but place the electrodes about 1 inch away from the implanted device. You should be able to see the outline of the device under the skin. If the person is not breathing or if he is breathing very shallowly and his lips appear blue, perform rescue breathing at a rate of about 12 breaths per minute or one breath every 5 seconds. Even when defibrillation is successful, the heartbeat still may be irregular or very weak. CPR is necessary to maintain circulation and oxygen delivery to the brain and other vital organs, including the heart muscle itself. What if I forget how to use an AED? Don’t worry about forgetting! All AED’s are equipped with voice prompts and visual instructions that tell you exactly what to do and how to proceed. It is difficult to make a mistake using an AED; the machine guides your actions every step of the way. However, even if you do not do everything perfectly, it is far better to try to resuscitate the victim than to do nothing at all. Can I be sued for using an AED? Unfortunately, anyone can sue anyone in the United States. However, most states have Good Samaritan laws that protect laypersons who initiate lifesaving measures from legal liability. To date, no layperson has been found legally liable for using an AED. Generally, it is not possible to shock yourself while using a defibrillator. However, anyone who is touching the patient could receive a shock, so make sure to yell, “Clear!” before you deliver the shock. Should I seek out training? We strongly recommend taking a CPR/AED class. They are easy to find and available from a number of institutions, most notably, the American Heart Association and American Red Cross. Like most things in life, practice makes perfect. Have any other questions about using an AED? Ask the experts at Heartsmart by commenting below! I'm pregnant, and I have WPW (Wolff Parkinson's White syndrome) and I can't have my surgery until after I have the baby, should I buy an AED for my household?